WOW, what a battle of the minds that has taken place this past week. I have refrained from commenting because, honestly, it would be like a JV player joining the defensive line of the Panthers. Well bad example, the Panthers need help, but you get the point. Very interesting posts have been left both on Rob's Rants and on The Barefoot Bum’s blog. This intellectual tennis match has made me become a “free thinker”. Hey wait, I was one before. Anyway, point in here somewhere; I started looking around “the net”, which I am very skilled at, and I found the fab four of atheism, Richard Dawkins, Daniel Dennett, Sam Harris and Christopher Hitchens. And guess what? They filmed a 2 hour round table discussion on their atheistic, theistic, and secular views as well as their experiences in interacting with each of those groups. Now I know I cannot watch this and expect totally understand all the intracies of why atheists believe what they believe but I can gain more insight into the mind of an atheist. Very interesting stuff. To me one question loomed high above all others, what if we are wrong. Now “we” can apply to any of the three basic groups, atheistic, theistic, and secular, but I want to focus on “my” group, the theistic. I personally have no problems asking the question “what if I am wrong”. From what I gathered one of the “rubs” that the fab four had was the vehemently persistent opposition from theists to question their faith. Admittedly, that probably accounts for more than half of those professing to be Christian. What I am suggesting is that, much like the rise of free thinking atheists seen in society, there is also a growing movement of free thinking Christians and non-Christians. There are groups out there willing to ask some of the same questions that atheists ask. I propose that the people that are getting the most attention are the “squeaky wheel” fundies. I myself have encountered them from all three aforementioned groups. Bottom line, I am willing to have open, non-defensive discussion on a wide range of philosophical and social topics. I also hope that we move towards having a society where the sensitivity in the discussion of these topics diminishes. The question still remains, what if you are wrong and I am right? There was a post the other day from Rob’s Blog and there were one or two things Larry “the Barefoot Bum” Hamelin and Rob “the Rev” Singleton said that have been gnawing at me to respond to. Now to begin with I am no statistician, theologian, or claim to be an expert in any field for that matter. I do come pretty close to being an expert when it comes to computers and cooking though. : ) Anyway, I am a fairly young Christian, when I say “young” I have only been a believer for about 10 years now. I was once a "militant" atheist sometimes agnostic for many years. I have been a student of countless world religions, cults, and belief systems. In fact, and I will probably catch some flack from someone by saying this, by definition Christianity is a cult. Our culture has put a negative spin or connotation on the word cult but that is another discussion altogether. ADD moment over, for now. Introductions and background aside, back to the post. Larry, commented, "I must say, I’ve never encountered anyone who seems “radically transformed”, but I have met many Christians who were very nice people." This was in response to one of Rob's earlier replies from the same post stating, "On the other hand, I doubt you’ve encountered someone so radically transformed by the love of Christ that their life just overflows with kindness and an attitude of servant hood, a joy for living, etc. that stuff’s pretty appealing." I think at this point the discussion was, of course, way off the original topic. It could have become a whole new blog, hey it did, or message series in and of itself. So, question one for Larry and Rob. What would it take for you to believe and/or prove that you have encountered someone who has had what could be defined as a "radical transformation"? Furthermore, perhaps a definition from both of you of “radically transformed” would be in order, please? : ) My attempt at a definition is below. Without being too presumptuous, as I am sure I have already been; Rob I think you touched on the answer to my question. You talked about someone being “radically transformed by the love of Christ” but perhaps that answer could be expanded on and explained further. Larry, based on what I have read from your blog and commentaries you are well versed in statistics, probability, and that you consider yourself an amateur philosopher. Do you think that “radical transformations” can occur? (spiritual, natural, metaphysical, etc.) Any and almost all answers from anyone at this point would be either theoretical or simply one’s beliefs of course. ; ) MHO is below. From my perspective Larry and Rob’s discussion was more likened to, or rather became, a debate about spiritual matters rather than the topic concerning social matters that sparked the original conversation. I believe the two are linked but I would never presume to tell someone else their lifestyle is wrong or flawed. I am pretty sure that was not Rob’s intention either but again that was the catalyst for the discussion, which ultimately is a good thing. I can say that myself and others close to me, have experienced firsthand several "radical transformations". I categorize them as spiritual and physical life changing events that sometimes seemingly had no meaning to some but to others there was no question that those “events” were not merely chance or coincidence. That of course would make it a matter of one’s perspective or viewpoint. IMHO in most cases those two words, “radical” and “transformation” barely describe the changes, both positive and negative, that I have gone through and/or witnessed. I have seen things happen, for good and sometimes for bad reasons. I am not deluding myself either, trying to find meaning or purpose in the minutia of day to day life. I did that for long enough over intellectualizing, internalizing, or trying to escape reality. It is not just a feeling I have, a hunch, or a guess, I know in my mind and in my heart that it was in God’s will for the things to happen or unfold as they did. Again this is my belief in an omnipresent, loving, God, and also another topic, freewill, destiny, pre-ordination, etc. The choices made and how things played out, in some cases, were firmly grasped by human hands. I do believe that we all have a purpose for our lives and it is revealed to us daily. Our lives will be our legacy to others regardless of what decisions we make or what we believe. How that changes our environs depends on if we create or destroy, it is as simple as that. Ultimately no matter what we believe, “…what we do in life echoes in eternity”. rob's rants: Let's just give it Time. and rob's rants: A respose to, "Evolution and Chance"
I posted the following on Rob's blog but I thought it would be good to post it on my blog as well. Enjoy! Dee and I always grin and joke around when we pass by or hear that a church is having a “revival”. You know the kind, complete with good old fire and brimstone yelling, (I mean preaching) with the covered dish buffet, and baptism under the tent. 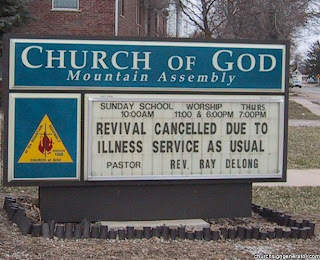 Well the baptism part is great but we always ask ourselves, what needs “reviving” so bad that they need to have a revival in the first place? Forrest Gump’s voice in the background, “That’s all I have to say about that”. Ok Rob, here goes, ALA KAZAM! Ok I will be the first to admit I LOVE MY BORING LIFE!!! I will also admit that I have watched those “Swap your wife” shows. They make me squirm. I do not have that much drama in my life and I like it that way. Peace and tranquility are my goal in my household. Well, some of you know that this past Friday (2/1/08) Carl, my 7 year old son, had pretty extensive ear surgery. Well, while we were waiting for Carl to come out of surgery I got a call from my 5 yr old son’s kindergarten teacher. She thought that he had had a mild seizure. I typically don’t panic but to hear the teacher’s voice I was concerned. So I had my mom go and pick up the children. Carl came out of surgery and then my mom and I flipped. She sat with Carl and I went with Will. Needless to say I spent 11 hours in the hospital. I was WIPED! Thankfully to all the prayers that went up for my boys, they are fine! Carl is recovering well and we have moved Will’s appointment up for the Neurologist to this Thursday (2/7). I want to thank everyone for their prayers! Our God is AWESOME!!! I will pass on anything like this happening again because I love my boring life! I like watching a circus but not participating in one!! See the previous post below if you are coming here from Rob's blog looking for my dating "horror" story. I don’t think many people know that Matt and I met online. Yes 12 years ago we met on AOL. I wasn’t into internet dating or chat rooms or anything like that and I don’t recommend it to anyone either! In 1995 I tried this new thing called "the internet"! I had just completed an internship in New York City and I wanted to keep in contact with my boss(es) but didn’t want the phone bills. They did have e-mail, even back, then so I signed up of AOL. (It was the cheapest at the time and pretty much everyone with internet access was on dial-up) A friend of mine in college signed up at the same time I did. She began chatting on AOL with people and that progressed to “in person” parties. This is where you get to meet the people you have been chatting with online. Being the responsible friend I am I wouldn’t let her go by herself. BTW, I only went a total of two times, no really I did! We spoke several times over the next couple of weeks and made a date. We went to another party but sat in the back in a secluded booth. I have to admit that I was enamored with Steve. He smelled so good, had that "rocker hair" and was HOT! I couldn’t keep my hands to myself I had to run my fingers through his hair! That is when I realized that NONE OF IT WAS HIS!!!! This long hair was a WIG! No not a weave, not a toupee but a WIG!! Then he proceeded to tell me that I “discovered his secret”. I didn’t want to pull away in disgust but when he took the wig off to show me his scraggly hair I couldn’t help but want to scream like I had seen Frankenstein! I stood there stunned trying really hard not to laugh right in his face. I let him leave with his delusion and pride intact! Needless to say I never went to another party again and I stuck to my small circle of friends to talk to online!